Production: P.E.A. ; Technicolor, 35mm, Techniscope; running time: 180 minutes, English version is 162 minutes. Released 1966 in Italy; released 1968 in US. Filmed 1965–66 in Spain. Delli Colli; editors: Nino Baragli and Eugenio Alabiso; art director: Carlo Simi; music: Ennio Morricone; special effects: Eros Bacciucchi; costume designer: Carlo Simi. Cast: Clint Eastwood ( Joe ); Eli Wallach ( Tuco ); Lee Van Cleef ( Setenza ); Aldo Giuffrè; Chelo Alonso; Mario Brega; Luigi Pistilli; Rada Rassimov; Enzo Petito; Claudio Scarchilli; Al Mulock; Livio Lorenzon; Antonio Casas; Sandro Scarchilli; Angelo Novi; Benito Stefanelli; Silvana Bach; Antonio Casas; Aldo Sambrell. Staig, Laurence, and Tony Williams, Italian Westerns , London, 1975. Parish, James Robert, and Michael R. Pitts, editors, The Great Western Pictures , Metuchen, New Jersey, 1976. Fornari, Oreste de, Sergio Leone , Milan, 1977. Frayling, Christopher, Spaghetti Westerns: Cowboys and Europeans: from Karl May to Sergio Leone , London, 1981. Johnstone, Iain, The Man with No Name , London, 1981. Zwijewsky, Boris, and Lee Pfeiffer, The Films of Clint Eastwood , Secaucus, New Jersey, 1982. Cole, Gerald, and Peter Williams, Clint Eastwood , London, 1983. Cebe, Gilles, Sergio Leone , Paris, 1984. Fornari, Oreste de, Tutti i Film di Sergio Leone , Milan, 1984. Guerif, François, Clint Eastwood , Paris, 1984; New York, 1986. Cumbow, Robert C., Once Upon a Time: The Films of Sergio Leone , Metuchen, New Jersey, 1987. Simsolo, Noël, Conversations avec Sergio Leone , Paris, 1987. Claudio, Gianni di, Directed by Sergio Leone , Chieti, 1990. Ortoli, Philipe, Une Amérique de légendes , Paris, 1994. Baldelli, Pio, in Image et Son (Paris), May 1967. Time (New York), 4 August 1967. Pierre, Sylvie, in Cahiers du Cinéma (Paris), April-May 1968. Durgnat, Raymond, in Films and Filming (London), November 1968. Badekerl, Klaus, in Filmkritik (Munich), October 1969. Frayling, Christopher, "Sergio Leone," in Cinema (London), August 1970. Wallington, Mike, "Italian Westerns—A Concordance," in Cinema (London), August 1970. Graziani, Sandro, in Bianco e Nero (Rome), September-October 1970. Ferrini, Franco, "L'anti-Western e il caso Leone," in Bianco e Nero (Rome), September-October 1971. Baudry, Pierre, "Idéologie du western italien," in Cahiers du Cinéma (Paris), November 1971. Kaminsky, Stuart M., in Take One (Montreal), January-February 1972. Bodeen, DeWitt, "Clint Eastwood," in Focus on Film (London), Spring 1972. Jameson, Richard, "Something To Do With Death," in Film Comment (New York), March-April 1973. Simsolo, Noël, "Notes sur les Westerns de Sergio Leone," in Image et Son (Paris), September 1973. Chevassu, François, "Ennio Morricone," in Image et Son (Paris), Spring-Summer 1974. Beale, Lewis, "From Spaghetti Cowboys to the Jewish Gangsters of New York," in Los Angeles Times Calendar , 7 November 1982. Mininni, F., in Castoro Cinema (Florence), November-December 1988. Ovrebo, O. A., "Makkverket, mesterverket og kulten," in Z Filmtidsskrift (Oslo), no. 4, 1992. The western for Sergio Leone is a genre in which he can explore his own sad, comic, grotesque, and surreal vision of life. Leone is no more interested in what could or did happen in the West than he is in any conception of surface reality in his films. The Good, the Bad, and the Ugly is a comic nightmare more in the tradition of Kafka than that of John Ford or Howard Hawks. 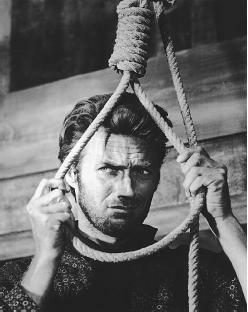 Although Clint Eastwood had, with Leone, established the antihero in A Fistful of Dollars and For a Few Dollars More , it was here, in their third and final film together, that they set out to destroy the more simplistic image so successfully that they contributed to the decline of the western in cinema. In the film, the Eastwood character ("the Good" of the title), called "Blondie" quite ironically by Tuco ("the Ugly"), is both amused by and aloof from the grotesque world. The massive destruction of the film as exemplified by the Civil War (against which the quest for buried gold is played) demonstrates an evil beyond "the Good" man's capacity to control it. With this totally corrupt world around him, he is more interested in living according to a certain style, showing others that he knows how to face danger with amusement and without fear. In this sense, the Eastwood/Leone hero becomes an almost mystic survivor, a new ironic Christ offering a way to face life. "The Bad" in the film (Lee Van Cleef's "Angel Eyes," itself an ironic appellation) is in many ways similar to "the Good." Neither is defined in his goodness or badness by the traditional morality. Between the two non-extremes stands, or rather scurries, Tuco, "the Ugly"—physically coarse, bearded, a bit dirty, but vibrant and alive in contrast to the other two cold characters. Tuco is hyper-human, and can show great affection as well as great hatred and violence. He has no cunning, is open and direct with an earthy simplicity and sense of humor. Good and Bad are false moral extremes. The ugly represents the human who acts out of animal immediacy without recourse to postures or guilt. Whenever Tuco resorts to poses (as a soldier, a friend) he suffers. In the film, Leone's use of the extreme close-up is a major device for getting to character; plot is of minimal interest. What is important is the examination of these characters. The close-up is used as ironic balance and the pan for thematic emphasis. For example, the dizzying pan which follows Tuco around the graves near the end of the film indicates the frenzy of Tuco in the midst of death as he seeks the hidden gold. In an interview Leone said that in " The Good, the Bad, and the Ugly , I demystified the adjectives. What do Good, Bad or Ugly mean? What does it mean when these characters are three killers thrown into the midst of a civil war? In that film, I was pursuing the theme that Chaplin so masterfully exposed in Monsieur Verdoux. " The film is filled with a number of vivid and powerful visual moments: the opening sequence ending with Tuco in freeze-frame, chicken leg in hand, flying through a window; Angel Eyes' calm murder of the man (and his family) who hired him for the job; Tuco's confrontation with his priest brother; Tuco and Blondie's trek through the desert; the battle at the river; the graveyard search for gold; and Tuco's theft of a gun from a frightened gunsmith. The feeling of unreality is central to the film and Leone's work in general. The film is a world of bizarre coincidence and horror. The apparent joy and even comedy in the destruction and battle scenes are often followed by some personal touch that underlies the real meaning of the horror which only moments before had been amusing. The dynamiting of the bridge between the Union and Confederate troops is presented as a touch of low comedy with Blondie pushing down Tuco's rear end before the moment of explosion. Yet this scene is preceded by the death of the sympathetic Union officer and followed immediately by an encounter with the dying young man to whom Blondie gives his poncho and his cigar, the two central marks of his minimal identity. The comedy and horror of meaninglessness are thus important in the film. The Good, the Bad, and the Ugly is a series of contradictions. It is serious and comic, moral and amoral, concerned with the meaning of history while indifferent to the facts of history, unconcerned with reality while filled with moments of tangible character and objects. Like the triumvirate it establishes in the title, the film is not about right or wrong, good or bad, just or unjust. It is a comic vision not far removed from the literature of Kafka or Celine in which we walk on the visual boundary line of comic ugliness. That the popular press found the film amusing but meaningless upon its release is but an expected footnote in the history of works of popular culture which were unrecognized by critics who thought that a violent, comic, and highly popular work could not possibly be worthy of serious attention.